Apple's so-called "iPad Mini" should be unveiled within a month or two if speculation is correct, and the rumor buzz is spinning fast about everything from the screen size to the features. Here's what you should know about the diminutive new iPad. If you just can't wait for a smaller Apple tablet to arrive on the scene, the latest rumor suggests you might be waiting longer than tech watchers first thought. All Things D reports that tech blogger John Gruber recently made some astute observations on the subject. He believes Apple will release the next generation iPhone on September 12, but wait several weeks before taking the wraps off of the highly anticipated iPad Mini. "The iPhone is too big, too cool, and garners too much attention -- and it's in Apple's interest to keep that attention undiluted," Gruber wrote, saying that it makes more sense for Apple to hold two events because in doing so the company gets more media attention for its products. "First, an iPhone event, focused solely on the new iPhone and iOS 6. Then, the iPhone ships nine days later, and there's another wave of iPhone-focused attention as the reviews come out. Then, in the first or second week of October, Apple holds its traditional 'music event,' exactly along the lines of the events at which they've been debuting new iPods for the last decade," he wrote. Regardless of the timing, one analyst says it's definitely coming. 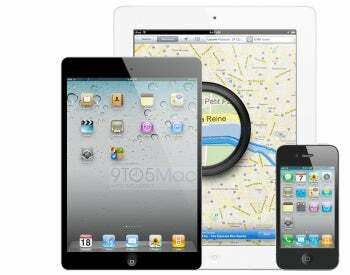 The iPad Mini is now in production at Foxconn factories, Peter Misek from Jeffries asserts. In a recent research note he claimed that the production of the iPad Mini has caused Apple's main manufacturing partner to see an unusual 5 percent increase in revenues in July. He also estimates that Apple will sell at least 8 million iPad Minis in the "December quarter," which includes the holiday shopping season. Another analyst, Amit Daryanani from RBC capital, recently wrote in a research note that if Apple launches the purported iPad Mini, it could sell 40 million of the 7-inch tablet within the first year. PCWorld's Jared Newman recently spotted images on 9to5Mac and the blog iMore, which indicated the tablet will look more like an oversized iPod Touch than a smaller iPad. Instead of equal-sized bezels all around the tablet, the images suggest that the smaller iPad will have narrow bezels on the sides when held in portrait mode, similar to the design of most smartphones. The form factor would make sense for the way smaller tablets are held -- in one hand, like a phone. Unlike 10-inch tablets, which you have to hold by the edges, you don't need a big bezel to cradle tablets in the 7-inch range. PCWorld's Daniel Ionescu recently found a chart posted on Twitter that indicates Apple's smaller iPad would not have the same aspect ratio as the Kindle Fire and Nexus 7, but one that's more like the iPad. If true, the iPad Mini's display would be as tall as the current iPad's width, given reports from Bloomberg and The Wall Street Journal indicating the size of the display will be between 7 and 8 inches. He pointed out that John Gruber calculated that in order to maintain the same aspect ratio as the big iPad, the smaller tablet would have a 7.85-inch screen diagonally, with a resolution of 1024 by 768 pixels. This would mean the smaller iPad would have almost 40 percent more screen territory than 7-inch tablets like the Nexus 7 or Kindle Fire.